The 61st annual Grammy awards show included several star-studded attendees and gifted us some of the most thrilling performances in the world of award shows. 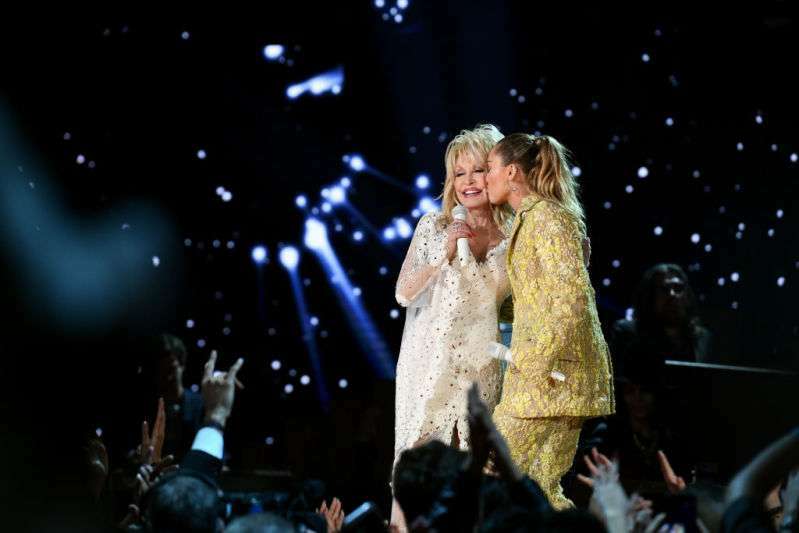 One of the most notable moments of the night was when the lovely Dolly Parton joined her goddaughter, Miley Cyrus, to perform a tribute. It wasn’t just a godmother-goddaughter affair, as the pair we joined by Kacey Musgrave, Katy Perry, and Maren Morris and Little Big Town at Staples Center in Los Angeles, on Sunday night, to honor Parton with the annual MusiCares Person of the Year prize. The tribute intended to celebrate Parton's ten years of favoured artistry in the music world and bring back memories. Parton won nine Grammy awards during her remarkable career, which added up 41 Billboard top-10 country albums. Dolly Parton gave a groovy vibe as she performed some of her classic tracks for the audience. Miley could be seen grinning and looking extremely happy as she pranced around with her godmother on the stage. Parton looked radiant in her white lace dress, while Miley looked poppy in her carton-brown blazer and trousers and her hair packed in a ponytail. Both of them looked stunning. We are glad that godmother and goddaughter were able to bond over what they love. It was indeed a bundle of joy for the audience that witnessed the awesome show.